Physical limitation is the specific point in which something in the natural (observable) universe has or will experience too much resistance to produce a specified, otherwise probable, outcome. As a good example, let’s say you take a bucket full of 1000 – 6-sided dice; and you wanted to know how many time you would have to turn the bucket over to randomly get the result in which each of the dice is face up, with the 1 on top. Each dice has the possibility to land on a number between 1-6 and we have 1000 dice total in the bucket. The math probability would be 1 in 6 for each dice to the 1000th power; or 6^1000 = 1.42 x 10^778 number of total possible outcomes you could roll. The law of larger number basically states that the larger a number is the more improbable it is that you will successfully reach a specifically desired outcome (especially in the physical universe). With that being said it would seem highly unlikely you could ever achieve your goal of producing a randomly tossed bucket with all 1’s on top. The law of extremely large numbers states that with enough random acquisitions (i.e. achieving the number of probability many times over, typically only possible in a computer simulation), the probability of eventually returning with a specifically estimated probability eventually becomes a reality. So if your probability was only 1 in a million; over trillions and trillions of tries, the likely hood of you NOT eventually returning with a specific outcome begins to diminish. Or in other words with enough tries, many times beyond its own probability, any set outcome can eventually become possible. However, even though probability works fine in a one dimensional world of mathematics & computer simulations, expecting the same results in our three dimensional physical universe is not in any way equivalent. 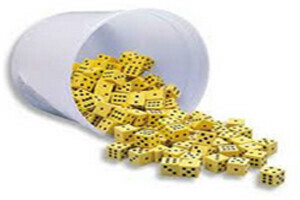 Realistically, or rather, physically, due to the size of our bucket, every time we turn it upside down all the dice do not ‘physically’ have the ability for free range of motion and therefore are ‘ limited’ to a specific number of probabilities. Many of the dice in the middle of other dice will be blocked in, and can only turn, for instance, between 2 of their 6 numbers. Unless the dice are ‘pre-positioned,’ by an intelligent source, to fall on the 1’s as a result of the bucket turning, the ‘physically limiting’ conditions of the bucket will prevent the probability (of all 1’s) from ever occurring and therefore has become an impossibility. Evolution depends on purely random natural mathematic acquisitions to have randomly produce complexity. A principle that has only ever been scientifically observed in our universe, or CAN only be produced in our universe, by intelligence. Physical limitations will always prevent complex structures in our universe from forming apart from intelligence, due to the limited physical restrictions that randomized patterns form in nature. The law of irreducible complexity is the principle fact that any complex system composed of well matched interacting parts that contribute to a specific function, wherein the removal of any one of the parts causes the system to become less effective or cease functioning. This scientifically observable principle is the bases that every structure has a designed purposeful intent that cannot be reduced in its total complexity. This purposeful complexity shows that an Intelligent Designer must be behind every work in all creation that we can observe in the universe. It was originally proposed by Michael Behe a biochemist of Lehigh University. 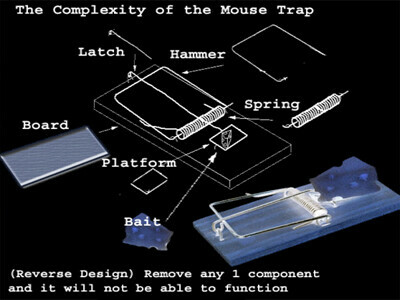 If you remove just 1 component from the mousetrap, the entire system will not work. Therefore if a system cannot reduce its complexity and remain functional, how could we expect it have moved forward in complexity from any earlier stage if it would not have been able to function? This example can be followed through as we look at every structure not only in biology, but engineering, ecology, astronomy, physics, etc. 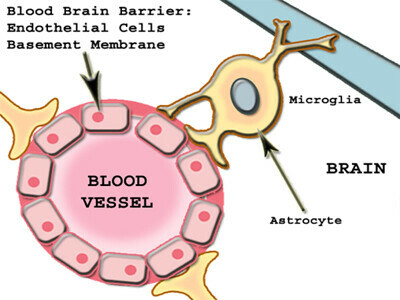 For instance consider the blood brain barrier. This is a type of tissue that allows oxygen into your brain while preventing contact with blood, because blood is toxic to your brain. Now what evolved first, the central nervous system (brain) or the blood (vitality to entire organism) or the barrier which prevents the brain from being destroyed by the blood? Let’s perform an evolutionary thought experiment from what we know about the blood brain barrier. Let’s zoom in on the time period when we have a multi-cellular organism that has a central nervous system intact and for some reason has a genetic mutation that begins forming blood vessels within it (even though forming blood vessel themselves is a monstrous task for the evolutionary theory). We are going to fast forward to the time when the vascular system is beginning to be toxic to the nervous system. Once the blood vessels begin to form as a functional system within the whole organism and carries nutrients throughout its body, it reaches the central nervous system and in a primitive world does little or not much damage because as it evolves they become more symbiotic and over time develops a barrier (the bbb) to help prevent damage to the nervous system (or ‘pre-cerebral’ central-network). = HOW COULD COMPLEX SYSTEMS LIKE THE BLOOD-BRAIN-BARRRIER RANDOMLY COME INTO EXISTENCE? Now we have a few problems with our thought experiment, first of all how could the nervous system benefit from a newly forming vascular system if it already had a working system in place as a functional, small organism? The vascular system is only going to be an inferior vestigial organ (or system) until it begins replacing the old system, and once it does it will become an issue as intoxication occurs to the nervous system (or brain). If we have a starting point in which there was no advanced nervous system and it only had an advanced vascular system; why would the evolution of the organism switch to a newly forming, vestigial, inferior nervous system that would be intoxicated by an already existing circulatory system. In every scenario, ‘Natural Selection’ would constantly work to kill off the ‘new’ inferior nervous system. The only working evolutionary scenario for this problem is that somehow a miraculous occurrence had spontaneously mutated the organism’s genetic code allowing for the formation of the blood brain barrier at the right time to create a symbiotic effect between both systems. No matter how we look at the problem, we always have the chicken or the egg problem. As this creature evolves, if the system was already in place (blood connected to the brain) why would it ever need to develop BBB, because it would have just evolved some other way to remain in contact without disruption. If the blood system began to become toxic throughout other advances in the evolutionary process the creature would have simply died and never would have gotten the chance to pass on its beneficial change due to toxicity. The brain wouldn’t have evolved the barrier without need, nor would it have been a vestigial organ until it found some use (a miracle just waiting to happen, in the right place at the right time coats in the veins in a perfect manner)? If the barrier would have began to gradually form because there was slight toxicity being introduced through the evolutionary process once again we are talking about miracle after miracle that the genetic information is changing perfectly to match each system, taking each little step to produce something so complex as what we see today, and how could each have simultaneously evolved quick enough to match each components needs of the other system. The creatures vascular (blood system) would have evolved too far ahead beginning to introduce too much toxicity once again killing our creature, or the barrier would have began evolving without reason to eventually complement the toxicity in the blood. So do we assume that at the exact same time that the circulatory system evolved to carry different types of nutrients, it also was carrying too much toxicity, thus the BBB began to evolve, another miraculous coincidence. Evidence would have to show millions of generations to get the programming correct for each gradual change just to produce the bbb. This is only for one small part of an extremely advanced organism that would need scenarios like this throughout every part of its millions of advanced systems. Trillions of years of random chance would not be enough to make the complexity we see today in each organisms different advance structures. We do NOT see this type of gradualization that is necessary for these types of advancements in any part of the evolutionists ‘fossil record’ nor do we observe it anywhere today. What we do observe is micro-evolution as moderate changes are made within the genetic codes that already exist in the organisms DNA. Expecting something like the BBB to randomly form from DNA randomly combining sequences is literally like tumbling pieces of dirt and silicon together and expecting that a computer will eventually be created in the process. The fact still remains; that cells need these very base systems to function at all or it would be destroyed (if it cannot reproduce it would be destroyed). It must have a energy source, a motion center, an information center and a way to reproduce. It doesn’t matter if each of these eventual functioning systems had a different starting point as something else, these very basic functions MUST have been in place somehow, someway completely functional or the cell would simply cease to exist! Thus these basic systems are irreducibly complex. Basically the argument against this example comes down to the belief that each component could have possible been used to perform some other function first, and then through random change, eventually become useful to perform some other more advanced function. It needs to be understood, exactly what is being portrayed in the first example; the point that is relevant to Macro evolutionism is not whether each variant structures can be made (regardless of their placement or function), but whether those structures lead, step-by-gradual-step, to the structure displayed (i.e. 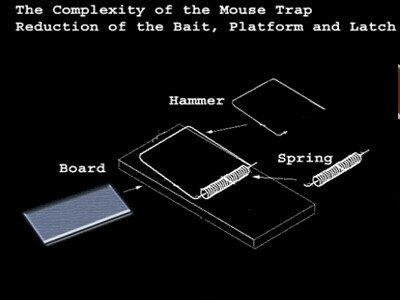 the mousetrap). Once it is understood that each piece cannot lead up through a step-by-step process to function as a whole system without every component, in perfectly designed placement, we can see that the entire design doesn’t work in reverse (thus irreducible complexity). If you just use a few part of the design the results will not accomplish the object or work at all, proving the concept of irreducible complexity.